Plus one makes a happy family. It had been 3 weeks since we arrived in New Jersey from Texas. I had not yet tried to navigate my new home on my own and to say I was nervous was an understatement. There was a book-signing by an author I wanted to meet at the Barnes and Noble on 86th and Lexington in New York City but Kevin was working, so I decided to brave it alone. It started off badly. I left for the station at 9:45 thinking I had plenty of time to catch the 10:08 train. The first part was supposed to be easy: by the ticket and get on board. I forgot about parking. When I got there, there was not a space to found. I drove around and - nothing! I missed my train. So, I did what any reasonable person would do: I sat in the car and cried. The next train was at 11:18. I pulled myself together and miraculously found a parking spot. The meter wanted $2.00 in quarters that I didn't have. I walked to a nearby bagel shop and bought a cup of coffee to break a $50 to pay the meter and then went on to the station. I had to wait 45 minutes but I finally bought a ticket and got on the train. When I boarded, I was so anxious that I plopped down in the first seat I came to, which turned out to be the very last seat with no window and very little cushion. The way my morning was going, I dared not get up to change to one of several empty, more comfortable seats. The ride was a little over an hour. I rode stiff-backed the whole way there but I made it to Penn Station. Phase One of the journey was complete. To my great relief, I found the E train right away. I successfully boarded then foolishly got off two stops later. Due to my inexperience reading a subway map, I got off the train about 5 miles too early but didn't realize it until I started walking. I ended up walking almost the entire width of Manhattan and then about 30 blocks North. I thought I might never get there, but miraculously, I made it in time to miss the author's talk and to be 2nd to last in line to get my book signed only to retrace my steps back to midtown. (This time using the subway correctly). Unfortunately, my return trip was not as simple as getting on New Jersey Transit and heading home. 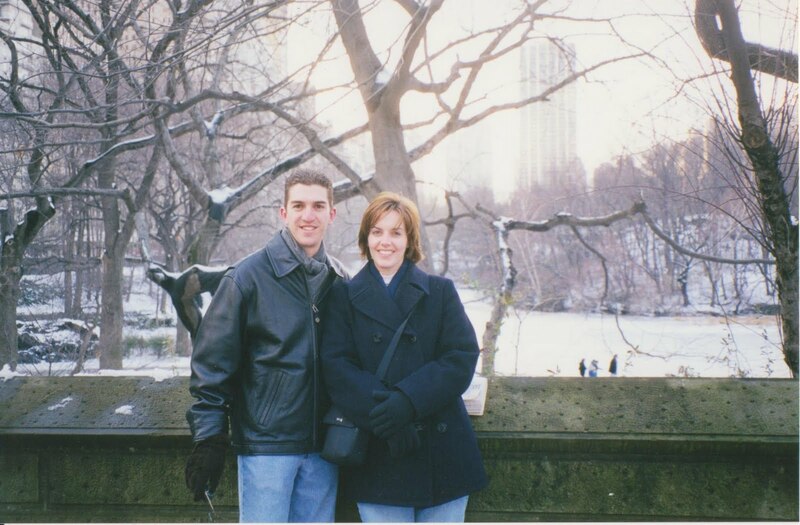 This trip was to take me to Hoboken to meet Kevin after work so we could ride back to Morristown together. To get back to Hoboken from Manhattan, you have to take the PATH train. In midtown, you catch it at 33rd Street. It should've be easy to find. It's right next to Macy's. Well, I'll be darned if I could find Macy's. I didn't have a map, I had to go by street signs alone. I was getting more and more irritated as the blocks went on and even though it was 20 degrees, I was starting to sweat. Some guy asked me where he could catch the D train. I said, "What, I should know? I can't even find the frickin' PATH. Where's the D train. Can you believe this guy?" Well, I didn't actually say that. It was more like, "I don't know, I'm sorry". Same thing. Eventually I found Macy's and the PATH. I walked to the platform opposite of where a bunch of people were standing. The train came and the doors opened.- on the wrong side! My side never opened! The train just left me there. Alone. On the platform. Looking like an idiot. There was a guy cleaning an out-of-service train who saw that I was confused, took pity on me and showed me where to go. I finally boarded the correct train, although I held my breath all the way to Hoboken, just to be sure. Arriving in Hoboken, I walked to the park on the pier, brushed snow off of a bench and had a seat. The park was quiet and across the river I could see cars speeding down the West Side Highway. The mania of navigating a foreign place was behind me and now I could rest on the bench as the dropping temperatures crystallized the sweat on my upper lip. The whole week leading up to this trip I couldn't wait to say, "Look at me! I'm in New York City! Finding my way! By myself! I am awesome." I finally said it, once I was safe and sound in New Jersey. 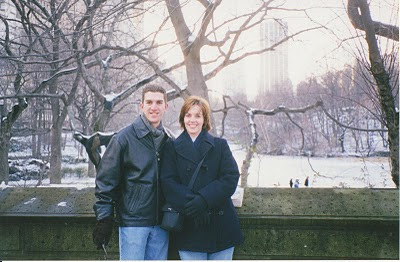 While strolling down 5th Avenue, Kevin and Mary stop for a photo with Central Park behind them. I liked your story but what a baby you cried when you hit your first bump. I guess you knew you had to get the tears out before you crossed the river into the big city. Doesn't sound to me as if you were lost, really. And you were smart enough to take public transportation! Yeah, I feel so foolish when the doors don't open. And I ended up on a local to Medford, arriving much later than my friend had expected. But it worked out. Before that, in high school, my class took a senior trip to Toronto. The group was out at Casa Loma and I got bored and left. I started walking without really knowing where I was going. I passed a person and he asked whether Casa Loma was this way (in the direction I'd come) and I said yes. I asked whether Yonge Street was this way (in the direction I was headed) and he said yes. So we both knew very little but we knew enough to help each other. (I didn't walk the entire distance - I got on the very clean subway for some of it). My husband and I had a free day in Jerusalem about ten years back and it's a reasonable sized city so we never really despaired of getting lost but many of the street signs (in English) have been rubbed out. So even with a map we weren't sure and usually could only tell by the grade (walking uphill or downhill) and the position of the sun to gauge our true direction. I'd much rather be "lost" in a major city than in some rural place without no where to turn for help. I spent 100 years in Manhattan one month. New York is a great city but my nerves couldn't take living there. It's good you recorded your excellent adventure for posterity. I enjoyed reading your story. Thanks everyone. When I found that journal I read the story to the kids as a bedtime story and my husband and I laughed so hard I could barely get through it! Moonshadow, you're right, I wasn't really lost, I just felt that way. Yours is a great story too! So funny, I've been confused in Manhattan so many times it's ridiculous! I came across your adventure and wanted to say that i enjoyed reading about it. I love NYC, it's a great place with so much to offer. Thank you very much. I'm glad you enjoyed it. It was a crazy day. I'm Mary, the mother of the 4 Turkeys. Here you will find the funny, poignant, ridiculous and ordinary stories of my life raising these silly birds to be saints and my own striving for a devout life (and a fit body).